After a long week of response to such a disheartening disaster, so close to home, we were able to focus back on the church here in Ome again, at least for a couple days. Belinda and I got some much needed rest and a chance to fellowship. During the week, while Belinda and I were in Higashi-Kurume each day, working with the approximately 60 volunteers, our emotions have been going back and forth. We have the joy of knowing we are where God has placed us, and we are overcome with the stark reality of all the lives that are either lost or are in desperate need. We do know this; that God is supernaturally sustaining us as we serve Him through all. In the midst of all this tragedy, we have a blessing. 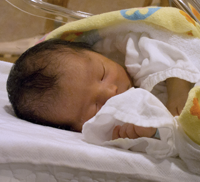 Our close friends Megumi and Kouji Suzuki have given birth to little Kota(baby boy). We were able to visit them in the hospital and share in their rejoicing. Megumi remarked that just before she arrived to give birth, the earthquake had caused many mothers to go into labor and that the hospital rooms were overflowing, some giving birth there in their waiting rooms. As you look at the images streaming across the internet and listen to the news, it’s easy to fall into trappings of the media’s market of depression and despair. Being here in the CRASH Command center, we not only hear the news of how bad things are, but are encouraged to hear first hand accounts of God’s Grace and the testimonies of His saints working here and in the field. You may have read about the grandma and the teenager that were discovered after 9 days of survival in the rubble of the tsunami. http://grassrootsnews.tv and http://www.foxnews.com/world/2011/03/20/rescuers-80-year-old-woman-teen-rubble-2145427460/ We sent out a team last week from here in Higashi-Kurume and are in process of getting several more set up. Our CRASH Team was the team that discovered the teenage boy who had made it to the roof to alert them of the grandmother buried below. The situation at the nuclear site is still urgent and frightening, but also know that at this point, no meltdown is occurring. The situation could be described as dangerous, but partially stabilized. We had an article on the CRASH’s site about a man, Nao Sato, who is heading the team of 50 who are working to bring the reactors back into complete containment. It turns out one of our Christian ministries here called “TEAM”, knows him personally. Nao is a brother in the Lord and he, like so many here, have not only given their lives to the Lord, but to Japan as well, that all might come to know Him. Please pray for Nao and the team working on the reactors. We are praising and rejoicing because God is good and He is using you to meet the needs of the Japanese and our needs as well. We have been so encouraged by your emails, Skype calls and phone calls. Thank you so much!! That people will continue to look to the rebuilding of Japan and to supporting our efforts so that we can make the most out of the opportunity God has given us during this time. We pray that this momentum will continue and that long-term relationships will continue to be established. This entry was posted in eNewsletters on March 21, 2011 by jmcbade.